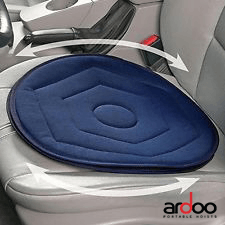 Provides increased seating comfort and is perfect for aiding mobility in and out of car seat or chair as it turns 360 degrees. Eases strain on back, hip or knees. For assistance in getting in and out of chairs or vehicles. Before using the cushion, ensure that it is placed on a surface which enables safe and secure seating for the user. Do not use if there is a risk of the cushion or user slipping from the seat.